I’m trying to get papers filed. Trying being the optimum word. One of my best friends says, “The difference between trying and doing is actually getting something done.” I don’t think I quoted that exactly, but you get the idea. I’ve gotten a lot done, but sometimes I feel like I just shuffle things around. Usually when I’m organizing I feel like I’m just moving things from one floor or room of my house to another. I’m working on it though. I really am. So, I decided I was going to go through a bunch of boxes and get some order back. 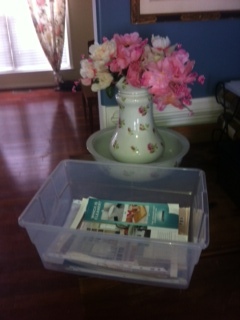 And I found a plastic box full of pages I’d ripped out of magazines – mostly Country Living. Pictures of rooms, furniture, arrangements, and anything else I loved. I think I’d planned on making a binder of my favorite things because I found page protectors in the box as well. Sounds like a good project for one of my creative kids :)! Looking at all the pictures brought a smile to my face. I enjoy dreaming about, looking forward to and planning for the future. Imagining wonderful things. Recently I was sharing with a friend how when I found out about my husband’s affair and knew the potential of him leaving, I imagined what our life would be like if we reconciled. I thought about how our relationship could be better than ever, how our love could be stronger, and how we could have a vital ministry to others who were struggling. When reconciliation didn’t happen, God refined my vision. Now I look forward to what God is going to do in my life in a different way. I look forward to what God is going to do in the lives of my children. I have great hopes and dreams for us all! I think it is part of the forgetting what lies behind and straining towards what is ahead. Catching the vision of what God has for us. Whatever it is, God uses some interesting words to describe our journey to get it. In thinking about pressing and straining in my walking (or running) out my faith, I believe having a vision is helpful. When I have something to strive for, I do better. Although with running I don’t need a stop sign or a set tree to run to – in fact, I’d prefer not to have a visual because sometimes I just feel like I’ll NEVER get there. But if I have a vision of the end, then I enjoy running more. I imagine how I’ll feel at the end, the sense of accomplishment, the joy of being done! I think I might be a little bit like that in my spiritual life as well. Hey! That sounds a little like faith! Thinking about eternal life is all well in good. But does eternal life necessarily mean good life? I say, “YES!” A whole-hearted yes! I don’t imagine heaven is a place of clouds, harps, and wings. I believe heaven is very much like what we are familiar with in terms of earth – He does refer to it as the new heaven and the new earth. I tell my kids we will get to enjoy all the wonderful things this earth has to offer but it will be perfect! No fear, no worries, no violence, no pain. What’s not to like about that!? Recognizing what I have to look forward to helps me press on through sorrow, pain, trouble, challenges, and even things that are pretty good by this world’s standards to strive to live a life of peace, joy and service here. And the most important part of heaven is Jesus. Oh my goodness! Epiphany! The vision – the goal, the hope, the joy, the thing to look forward to is JESUS! I guess there is something…I mean Someone I want to keep as my focus, my focal point as I run this faith race. I pray as we all run this race we will keep our eyes on the prize, on Jesus. So the answer to the question, “What does God have for us?” is JESUS. Previous Article Do You Know How to Count? As always thank you for the reminder of where to look, Jesus. I feel somewhat frustrated and stressed lately with my kids arguing more and feeling like I am always on them to listen. I do not like feeling down. I will try to remember God has everyone and we will be ok on this road. Thank u Susan for the awrsome reminder of what we have to look forward to! Thank I for sharing ur heart and thoughts always so encouraged by ur transparency. Blessing to u in this journey called life!